This cellarette consists of a finely figured solid mahogany lid with ebony stringing and mahogany crossbanding with a moulded edge. This leads down to fine brass banding and a brass knob handle, the top opening to reveal the original partitioned interior for bottles. 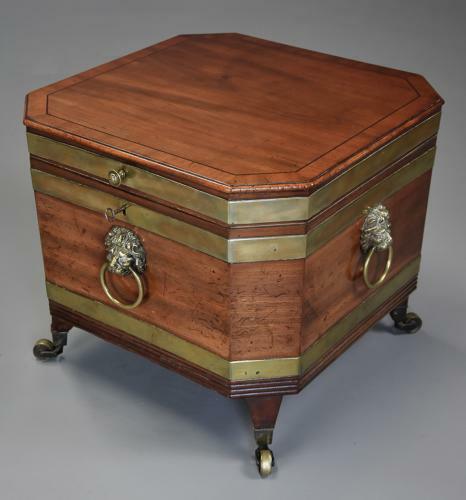 The main body of the cellarette having brass banding to the top and bottom with a reeded moulding below and fine quality lion mask handles to both the front and sides. The piece is supported on four tapered legs terminating on four original brass castors. This cellarette is a very versatile piece as it can be used as a wine cooler or could also be used as a small table. The cellarette is in excellent condition for age, is of stable construction and can go straight into a home.